← Is the Treasury Really Going Long? Another surprise is how little we are paying in interest on the federal debt, even though the debt is growing larger and larger. Right now, interest payments make up only about 6 percent of the federal budget. In addition, they have been decreasing as a share of the gross domestic product: the federal government spent about 1.5 percent of gross domestic product in paying interest on its debt on 2011, down from a peak of 3.3 percent in 1991. Silver and many other observers believe that the Treasury has been issuing “relatively long” maturities and that “we have locked in low rates.” As I wrote in Is the Treasury Really Going Long?, this perception owes to the recent lengthening of the weighted average maturity (“WAM”) of the marketable Treasury securities. The WAM is the average time remaining to maturity for the securities, weighted by their respective principal amounts. The Treasury reports it every quarter and it has its own Bloomberg symbol. The average maturity is now approaching 5.5 years. Many observers conclude that the Treasury pushes up the average maturity by selling “relatively long” maturities. But the new debt has a WAM of only 4 years. The average maturity of the whole debt portfolio has been increasing despite the relative shortness of the new debt. The portfolio would lengthen much faster if the new debt were not so short. It may be hard to believe, but the WAM of a portfolio can lengthen automatically as short securities mature and leave the portfolio. This odd phenomenon is the basis for a puzzle on this blog. Although it is the standard measure of the length of the Treasury’s debt, the weighted average maturity is distorted by the outlying long maturities. 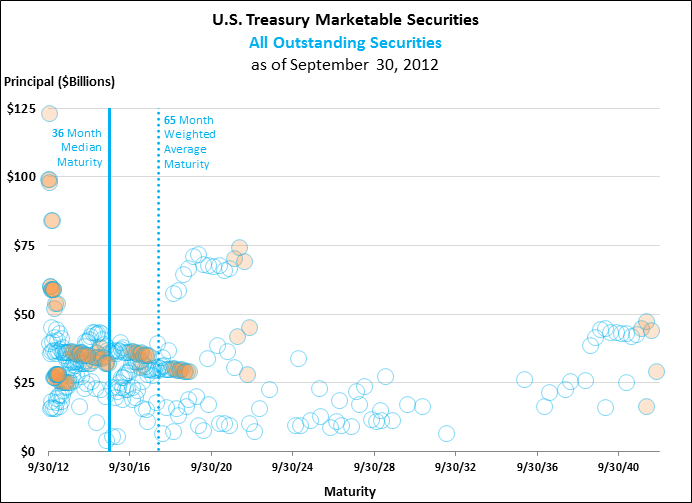 The following chart displays the 327 marketable securities that remained outstanding at the close of the last federal fiscal year (September 30, 2012). The principal amount and the maturity date are shown for each security. The dotted vertical line marks the weighted average maturity of 65 months (5.4 years). You might expect the WAM to divide the debt evenly, but actually the WAM is longer than 69% of the debt. Of the $10.7T (trillion) in marketable debt, $7.4T matures before the average maturity and $3.3T matures after. If we wanted to split the debt into equal parts, we need the median maturity. This is marked on the chart by the solid vertical line. The median maturity of all of the debt is only 36 months (3 years). Half of all of the Treasury debt is scheduled to mature by September 30, 2015. This is about when the Federal Reserve may start to raise interest rates, and it is more than a year before the next presidential election. Now consider just the new securities issued in FY 2012. These securities certainly had low interest rates (nominal rates ranged from near zero to around 3%). Excluding those that had already matured by the end of the year, there were 90 new issues for a total of $3.7T in principal (about $1.1T to fund the deficit and $2.6T to refinance older debt). To what extent have we “locked in low rates”? 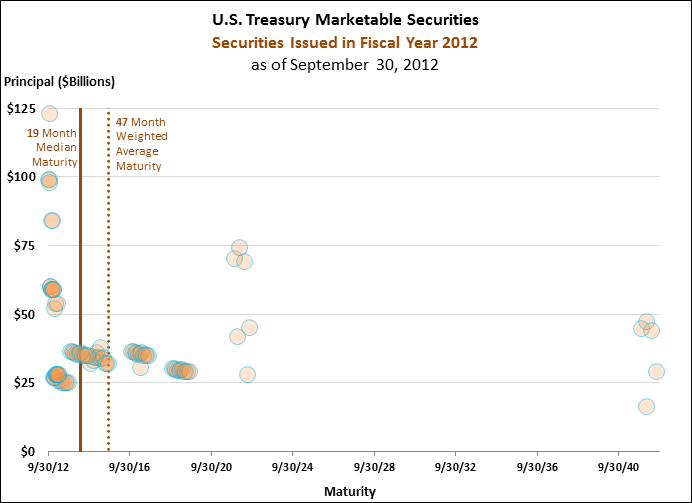 The average maturity of the FY 2012 issuance was 47 months (3.9 years). 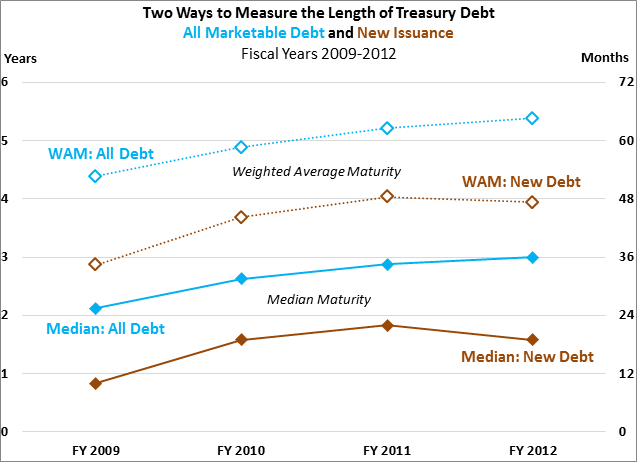 The median maturity of the new debt is much shorter, only 19 months past the end of FY 2012. Half of the new debt will mature by April 30, 2014. This is half a year before the next midterm elections (and the next James Bond movie). The final chart summarizes the debt over the last few years. The top top line growth in overall average maturity seems to have convinced Nate Silver and others that the Treasury is increasingly selling long debt. However, the chart’s bottom line shows that the median maturity of recent issues never exceeded two years. 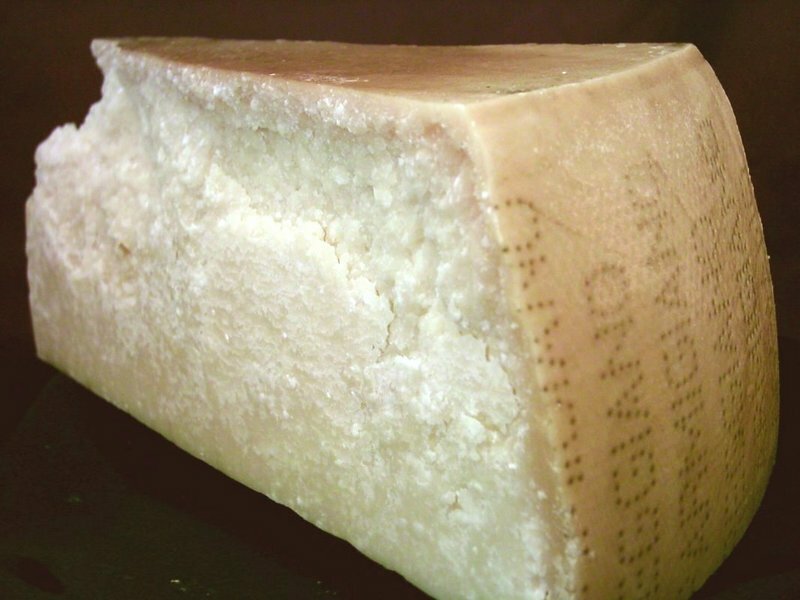 By comparison, the best Parmigiano Reggiano matures in 24-36 months. I wouldn’t say that “much of the debt we have issued has relatively long maturities, meaning that we have locked in low rates” when half of the Treasury’s new debt will mature faster than a premium cheese. This entry was posted in Bonds, Economics and tagged Median Maturity, Nate Silver, Treasury Debt, U.S. Treasury, Weighted Average Maturity. Bookmark the permalink.